What started as an idea (after losing a pair of very, very expensive glasses on a backpacking trip), is now a company worth over $1.2 billion dollars. If you’re not familiar with Warby Parker and their inspirational story, read this. A major key to Warby Parker’s overwhelming success is their ability to keep pushing the boundaries of innovation. Their social media marketing strategy is a clear proof of that. They don’t do things like everyone else; they do it their own way and it’s paid off massively. Let’s take a look at their impressive numbers, shall we. However, their biggest social media success isn’t in these number, it’s the way people engage with them and rave about them. Dwindling attention spans. Goldfish. 8 seconds. With phones constantly buzzing with the latest updates and constant notifications, instant gratification is on an all-time high. Consumers no longer have the time or patience to sit through long videos, when smaller ones will suffice. And smart marketers, such as Warby Parker, are taking note of this. 56% of all videos published in the last year are less than 2 minutes long. HubSpot discovered Instagram videos that received the most comments averaged 26 seconds. And Warby Parker’s Instagram videos are usually under 26 seconds, with most of them under 10 seconds. They haven’t cut longer videos into shorter ones to fit their Instagram video marketing strategy, but created shorter videos specifically for this social media. Introducing a revolutionary new way to clean your lenses. Psych! It’s very traditional, but also super useful. 👍 Our "Clean My Lenses Kit" (part of our Holiday Gift Guide!) gently removes dust, dirt, and fingerprints from your lenses. Notice how their video posts also get some of highest number of comments. This proves that shorter videos are generally better at retaining customers interest and prompting engagement. Warby Parker uploads slightly longer videos on Facebook, averaging a minute. 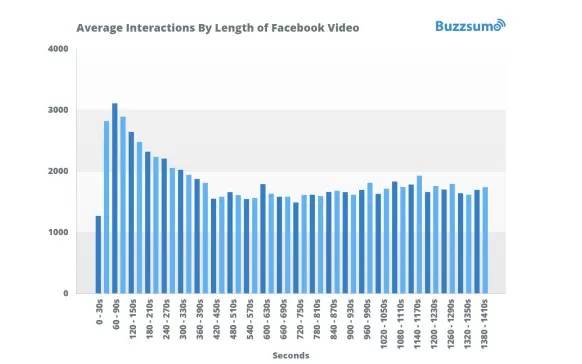 According to Buzzsumo, that’s an effective strategy since Facebook videos under 90 seconds perform the best. 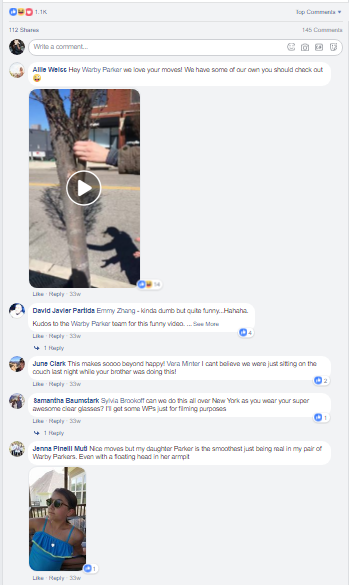 Some of Warby Parker team’s best perform videos have received over a 100 comments and shares, over a 1000 likes and ginormous amount of views. HubSpot suggests that brands should upload videos around 45 seconds long. And Warby Parker heeds their advise. They generally upload either shorter (under 15 second) videos, or in the 45 seconds to 60 second time range videos. The engagement levels on both these video types differ as well; their longer videos receive far more engagement than their shorter videos. Time lapse. Vlogs. Gifs. Boomerangs. Animated. Brand films. Why stick to one video type, when you can experiment with several? This is one of their most oft used video formats. They’ve used time lapse videos in a lot of different ways. There are several issues related to glasses that people aren’t aware of. Things like cleaning your lens the correct way, or which frame suits your face structure. And Warby Parker, in their trademark quirky, absurd and fun way, create educational videos for their audience offering solutions to common problems. Their research is spot on, because being a glasses-wearer since the past decade and half, I’ve struggled with most of the issues that they discuss. They upload a plethora of creative and fun boomerang videos, especially on Instagram. New fun campaign? Boomerang video. Promoting limited edition items? Boomerang video. New events, or events they’re participating in? Short vlog. Lol, just kidding. Boomerang video, of course. Anything they want their audience to pay close attention to, they upload a boomerang video of it. They show live Facebook footage of product launches, special events where their founders are speaking, new store opening, and the works. However, even these videos are under 30 minutes to prevent their audience from dozing off or scrolling past it. Work culture videos should be fun. They should be relatable. They should be real. And they should make you want to quit your job and work there ASAP. Warby Parker creates the perfect videos promoting their work culture. Since their target audience is mostly millennials, they know that fun and innovation need to be a vital part of their video creation process. They’ve used a mix of time lapse videos, super-short vlogs, and cute introduction videos to show their work culture. However, their stroke of genius is how they use their employees as actors in almost all their videos. Humorous, educational, boomerangs, culture jack videos, err’thing! So you see the same faces in all their videos and usually the same background (their office). Great way to get intimate with the Warby Parker team and think of them as your best buds. Everything’s been posted, talked about, and created in the digital world. If a brand is creating a certain video, chances are they’re not the first ones. So, the only way they can stand out from the rest is by creating a video that’s bursting with their personality. And that’s exactly what the WB team does best. They target young people addicted to Buzzfeed quizzes, SnapChat filters, Tasty 1 minute videos, selfies 24/7, and everything that’s silly and fun. And every little part of Warby Parker’s social media reflects this. Their video posts are silly, quirky, and loaded with self-deprecating humour. And their target audience LOVES them! Take this video, for example. And look at the comments section below. They put up their own versions of these videos, they LOL, they tag friends, they share it with others, and they participate. And this isn’t just a one time off thing. I selected this video randomly. Every single video or picture post they put up is equally funny and silly. Even their educational videos follow the same brand tone. Their employees and customers are encouraged to put up similar videos, too. No one has time to slog through your FAQ pages. They’d rather Twitter and ask. And if you don’t respond back on Twitter, you get blacklisted. As simple as that. So you need to up your Twitter game. Warby Parker’s Twitter customer service is on fleek. Apart from being prompt and super-helpful, they have a special Twitter handle dedicated to their customers. There they upload short helpful videos in response to their customer’s queries. This is a great way to stand out from the pack and go an extra mile to build better customer relationships. These videos are also super-simple to create and help to cross promote their YouTube channel. And after all, studies have proved that viewers retain 95% of a message when they watch it in a video compared to 10% when reading it in text. While Warby Parker’s videos are super simple, their visual and audio quality is excellent. Let’s discuss some of the things they’re doing right. In their videos, they generally use real background, either one of their stores or their Warby Parker office. This is a great way to make their videos seem more human and raw. Adds a playful touch to their videos, as well. There are no unnecessary distractions in the background. If people are milling about in their stores or office, it’s because team WB wants them to be part of the video. Every part of it is well directed. While they use a lot of their employees to present on video, these employees are confident and courteous (and, mostly completely crazy, too!) They present naturally and everyone in the background is in sync. They also take special care with the lighting. A lot of their videos are shot outside in the daytime, so they make great use of daylight. Their indoor videos are shot with ample lighting, and they try to use direct sunlight in these videos, as well. 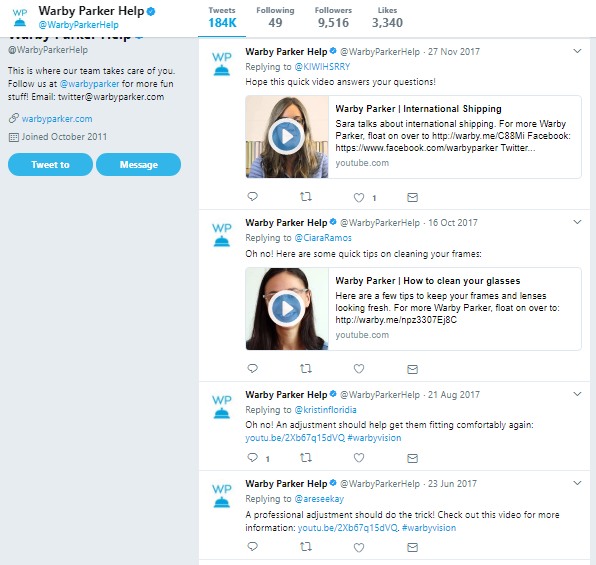 Warby Parker have run multiple campaigns over the course of years, and they try to involve their consumers as much as they can. Since they themselves upload a plethora of videos on their social channels, their consumers and followers follow suit and put up videos with their hashtag, too. #warbyhometryon (3/3) Should I get these glasses? 3) "These are called Caldwell in Carbon. You might notice I'm moving away from the acrylic frames and trying out some metal ones. I used to wear metal frames all the time. Maybe it's time to go back. What do you think about these? I can't actually see how I look in this at all." Special props for Warby Parker at liking, commenting and advising these people on the frames that look best on them. Customer service at its best! Collaborating with influencers is a great way to reach out to more people and become popular by association. Warby Parker collaborates with creative influencers who are not only popular, but also believe and promote the same values as the WB team - like professional storm-catchers, and Creative Fashion Designers like Virgila Bloh of Off-white. Where does video come in? Well, you’ll notice that they usually promote these collaborations by uploading video posts to increase the views and engagement. And it works amazingly. Thanks for a great @off____white c/o @virgilabloh x @warbyparker launch! The frames are sold out online—but the entire collaboration is available in select @warbyparker stores while supplies last. Remember we talked about interesting campaigns like WarbyBarker and WarbyHomeTryOn? Well, turns out that piggybacking on popular eye-related (and even non eye-related) events and creating awesome campaigns around that is Warby Parker’s favorite hobby. In these campaigns, they make sure to add multiple videos to further add interest. Let’s take a look at their ‘Solar Eclipse 2017’ campaign. They ran a lengthy campaign around last year’s solar eclipse, and rightly so. What could be more relevant to an optical brand, than this? 94 comments and over 31k views. Completely in awe of totality passing over our Nashville store just a little while ago. 😱 We hope everyone had fun watching the eclipse! So using videos while culture jacking is a great way to amplify your reach and create intrigue. What is the first thing that pops in your mind when you look at these images? Warby Parker cleverly uses their brand colour, or different shades of their core brand colour, and highlights it in a plethora of ways. This image is a collage of 7 of their recent videos uploaded on Instagram. And blue is a dominant color in each of them. However, instead of using a blue backdrop in all of their videos which would make them monotonous, they’ve used blue in a subtle yet different way in all of them. Fun fact: They’ve also created a hashtag around this color, #warbyblue. Warby Parker community uploads pictures with this hashtag whenever they come across anything that’s in this color. Team WB’s branding is right on target. The one thing that I admire most about Warby Parker is their affinity with taking risks. They experiment, they come up with new concepts, and they’re not afraid to be real in a fake, plastic world. So do it. If you haven’t yet jumped in the nerve-racking waters of video, do it. Try new things. Brainstorm new concepts. Be brave. The WB team lives and breathes this.